Pasta types have specific characteristics, like DNA, which make them unique to their home regions. There couldn’t be a better example of this uniqueness than Corzetti. Like Christopher Columbus, these tasty little pasta coins are native to the Liguria region of Italy, and seem to have become fashionable around the time of Italy’s Renaissance, when noble families would stamp their heraldic badge on the pasta. 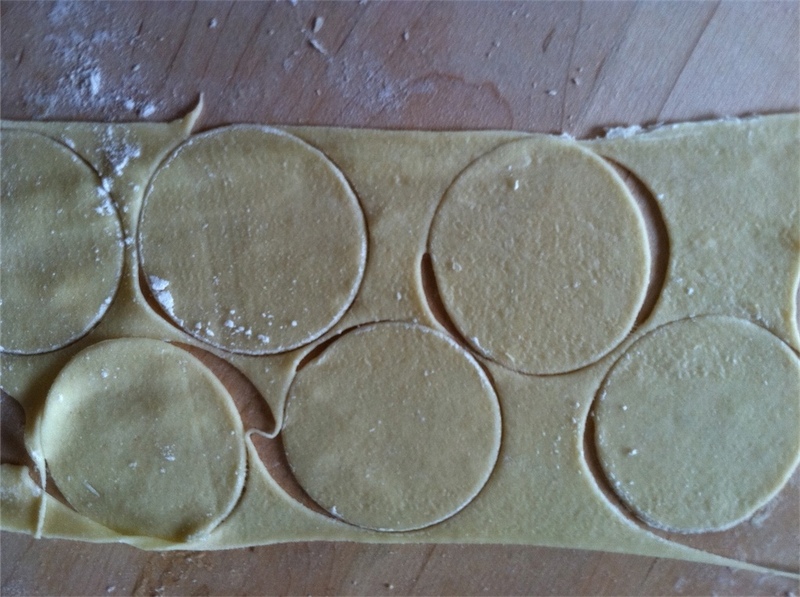 Corzetti rely on a dough a bit different than the basic semolina variety. The recipe we used is a variation on one used by our friend Mary Ann Esposito, of the PBS show Ciao Italia. It features fresh eggs, all-purpose flour, and (our addition) white wine. Pasta Machine — or other device to help roll dough, like a *rolling pin. Corzetti Stamp — This unique stamp consists of two parts. The bottom half has a circular cutter on one side and often has a simple design on the other — you can see the circle pattern our stamps feature below, which helps the cut pasta pick up sauce. The top half has a unique design used to make a pattern on the cut pasta, and a handle on top. We carry two designs for Corzetti stamps; we used the wheat stalk design for this recipe. * Rolling pin requires elbow grease. First, combine your dry ingredients (salt and flour). If you feel like cheating a bit (we did), you can put them in your food processor and giving it a quick pulse. Next, make a well in the middle of your pastry board (or on whatever clean surface you’re using to mix your dough) and add your eggs and wine. Gradually beat the eggs and wine into an even mixture, then start to incorporate the flour until you can knead with your hands. Knead until you have a nice, even ball of dough. Don’t be afraid to add a little flour, if needed. Or to take a sip or two of wine. After your break is over, quarter your dough ball (as seen above) and cover the remaining pieces you won’t immediately use to prevent them from drying out. Start to roll out your dough through your pasta machine, using the widest setting first, and gradually working your way down. Corzetti benefit from a slightly thicker than average setting. We stopped at third-from-last on our machine, which is what you see here. Lay your sheet onto your floured surface and (somewhat) firmly press the cutting portion of your Corzetti stamp. Don’t worry if you cut them awkwardly, or need to re-use the dough, as you would when cutting biscuits. Now take the bottom half of your stamp and lay it cutting side-down, so you can see the circle design pointing up at you. Take your impressionable pre-Corzetti discs and put them on top of the design on the bottom half of the stamp. The top half of the stamp, the part with the handle, should sit on top, as seen above. Press down (somewhat) firmly. This may take a few tries. Too hard, and you’ll have Corzetti dough stuck to the insides of your stamp. Too light, and you won’t get a very good impression. Repeat, oh, about 1,000 times (or however many you’d like to eat). Really though, our recipe yields about 4 dozen coins, give or take a few mistakes. We love to serve with the recipe by Mary Ann Esposito, which is sort of a deconstructed pesto, using minced marjoram and toasted pine nuts. Our wooden corzetti, or croxetti, stamps (Curzetti Stampae) are made in the Ligurian region of Northwestern Italy.